Using technologies and computational modeling that trace the destiny of single cells, researchers at the UC San Diego School of Medicine have described for the first time the earliest stages of fate determination among white blood cells called T lymphocytes, providing new insights that may help drug developers create more effective, longer-lasting vaccines against microbial pathogens or cancer. 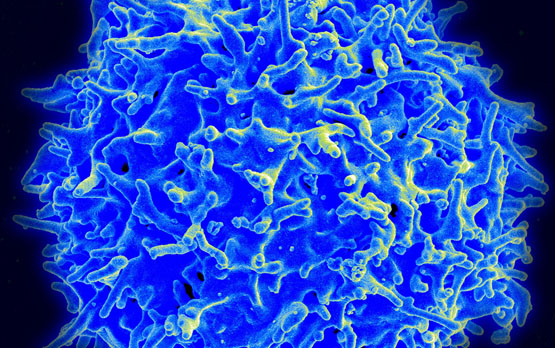 The findings were published in the March 2, 2014, online issue of Nature Immunology. Naïve T lymphocytes patrol the front lines of the human body’s defense against infection, circulating in blood and tissues, searching for invasive microbes and other foreign antigens. They’re called “naïve” because they have not yet encountered an invader. When they do, these T cells activate and divide, giving rise to two types of daughter cells: “effector lymphocytes” responsible for immediate host defense and “memory lymphocytes” that provide long-term protection from similar infections. “Researchers have been trying for a very long time to understand when and how T lymphocytes give rise to effector and memory cells during an infection,” said John T. Chang, MD, assistant professor in the Department of Medicine and the study’s co-principal investigator, along with Gene W. Yeo, PhD, assistant professor in the Department of Cellular and Molecular Medicine and Institute for Genomic Medicine. However, all studies up to this point were based on analyses on bulk populations of cells, making it impossible to understand fate decisions made by individual cells. First authors Janilyn Arsenio, a postdoctoral fellow in the Chang lab and Boyko Kakaradov, a graduate student in the Yeo lab and UCSD Bioinformatics graduate program said that they took advantage of recent technological advances in single-cell gene expression profiling and cutting-edge machine-learning algorithms to address this question on a level of detail that was not previously possible. Co-authors of the study include Janilyn Arsenio, Patrick J. Metz and Stephanie H. Kim, UCSD Department of Medicine; Boyko Kakaradov, UCSD Department of Cellular and Molecular Medicine, UCSD Stem Cell and Bioinformatics programs and Institute for Genomic Medicine, UCSD; and Gene W. Yeo, UCSD Department of Cellular and Molecular Medicine, UCSD Stem Cell and Bioinformatics programs and Institute for Genomic Medicine, UCSD and National University of Singapore and Genome Institute of Singapore. Funding for this research came, in part, from National Institutes of Health (grants DK080949, OD008469, AI095277, HG004659 and NS075449), UCSD Digestive Diseases Research Development Center, the California Institute for Regenerative Medicine, the National Science Foundation, the Alfred P. Sloan Foundation and the Howard Hughes Medical Institute.